A kitchen scale is an indispensible tool for bakers and bread machine users. This is especially true if you want consistent results. Sometimes people tell us that they’re not getting good results with their bread machines, and that’s usually because they don’t measure their ingredients accurately or add them in the right order into the machine. That’s why we strongly encourage everyone who uses bread machines – and who bakes – to invest in a kitchen scale. But not just any kitchen scale. A digital kitchen scale. The type that precisely weighs your ingredients down to at least 0.1 gram increments. Baking ingredients are most accurately measured by weight, and when baking bread automatically with a machine, the smallest of weight matters. 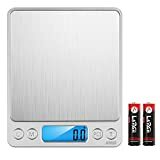 So a digital kitchen scale that can measure down to 0.1 gram can tell you whether to add or remove more of the ingredient you use. When you look inside your bread machine manual, you’ll likely find some recipes calling for one teaspoon of this or one cup of that, and beside it there is usually the weight of those ingredients in “ml” or “grams”. We highly suggest that you follow those recipes according to the weight in order to get the best, most consistent results. While there are plenty of digital kitchen scales for sale, not all of them can measure down to 0.1 gram increments. You have to look closely to see if the product is able to do this. Most scales measure down to a single gram, but in fact, they can’t even detect anything below 5 grams. So the precision and quality of the scale you get matters. To make things easier for you, we’ve gone ahead and picked out a few digital kitchen scales that can measure down to 0.1 gram increments. This AMIR scale is a generic-looking scale that looks like it was sourced directly from a factory in China. It looks the same as many other scales. But don’t let that deter you from getting this. It’s a high-precision scale that can measure from 0.1 grams to 3000 grams. It operates on two AAA batteries. It’s got a large LCD screen that’s easy to read. You can measure in grams as well as five other measurement units with this scale. While it’s not exclusively made for kitchen/baking purposes, and most scales in fact are multi-purpose, it will do the job well. It’s a sleek-looking scale that will look nice on your kitchen counter too. And for what it can do, the price is hard to beat. 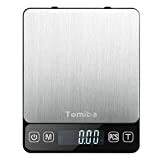 This Tomiba scale is very similar to the AMIR scale. It can measure from 0.1 grams to 3000 grams and operates on two AAA batteries too. It’s got a large LCD screen as well and can measure in grams and five other measurement units. The main difference is that it has a touch screen design so it feels a bit more modern than the AMIR. And the touch screen section looks a bit more attractive in our opinion. But in terms of functionality they are quite similar. What’s great about this American Weight Scales (AWS) digital scale is that it comes with an AC adapter so you don’t always have to find some batteries to operate it. If you want to power it by batteries it will take two AAA batteries like the other scales. Besides this, the quality of this scale seems more reliable, along with the company, and it comes with a whopping 10-year warranty. However, it is only capable of measuring between 0.1 grams to 2000 grams (so 1000 grams less than the other two scales). But for people using this to bake bread, it shouldn’t be a big problem.